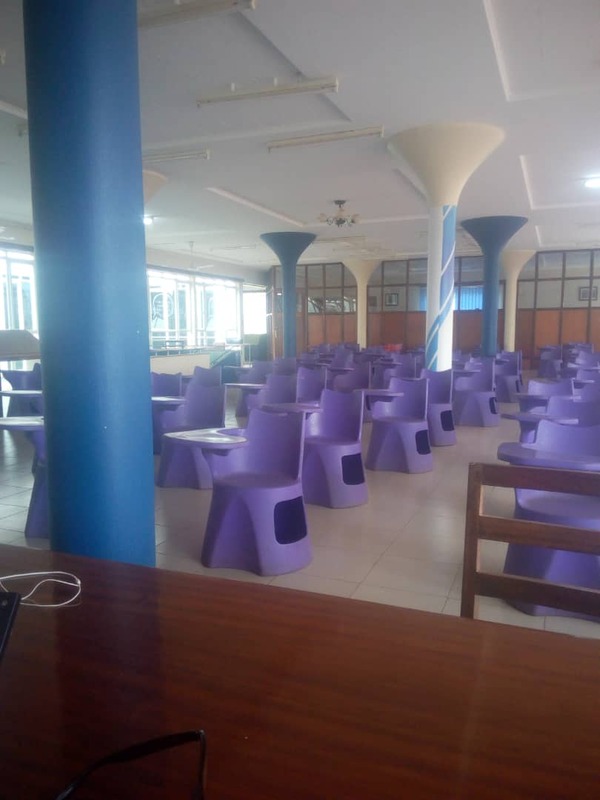 These seats were introduced as a result of launching new buildings at Kyambogo that were completed early this year and needed furniture to accommodate students. As a result, plastic seats, commonly reffered to as ‘Potties’ with the Kyambogo University Logo were ferried in large numbers into the building which aroused nationwide criticism especially from Makerere students. Well, if you hadn’t found out yet, it seems like Kyambogo was not destined to suffer this fate alone. Take a simple stroll at the Makerere University School of Health Sciences where the Medicine students take their lectures and you will not hold back your laughter and shock. The College has not only introduced these seats in the Lecture rooms but also placed them in the College Library to provide space for Students’ personal reading. This photo of ‘Pottie-Like’ seats in the Library premises at MAK leaked in a Kyambogo Whatsapp group on Tuesday evening and left most Kyambogo University students excited and wondering why these MAK dudes were making fun of them when the same scenario happened in Banda early in February. In fact, one of the Kyambogo students within the Whatsapp group humorously gave the following comment. “When these funny scenarios happen at Kyambogo University, most of our colleagues from other institutions are quick to make fun of us because they are used to dissing the University. However, these pottie-like seats must have spent close to months at the Makerere Library but no one came out to shed light on it,” the female student submitted her comment. Others wondered how such seats could be placed in a Library. In most cases, the Libraries have tables to accord the reader comfort and space to explore various reading materials. Most Kyambogo dudes dissed this arrangement at MAK claiming that their University cannot reach the extent of placing ‘potties’ in the Library. Whatever beef and grudges that students from the two gigantic public institutions hold against each other, what remains evident is that the discussion concerning ‘pottie-like’ seats has surely leveled the grounds for even the marginalised to hurl insults at the seemingly invulnerable students from the Ivory Tower.